Open up the marketing opportunities by adding your company name or logo to this uniquely designed letter opener! Featuring a traction grip, this office accessory makes an ideal tradeshow giveaway or tote bag insert. 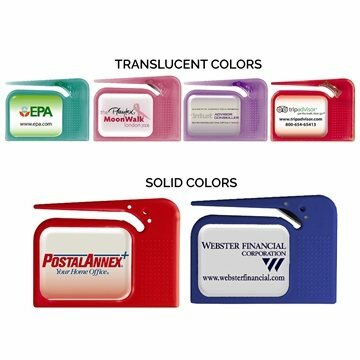 Choose from the variety of solid and translucent color options, add your custom imprint and use as part of a "welcome" package for new employees. Great for mail rooms, corporate offices, delivery services and much more! They were popular at our participants booth. Thank you for the great product, I will order again soon. Fast service & great account representative! the product was exactly what I ordered. I ordered the products for our staff and they were very good quality and the logo looks great.